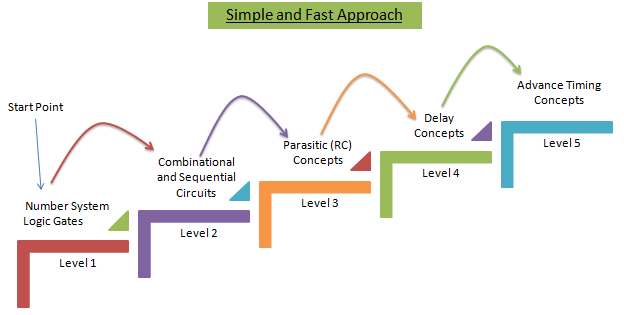 "5 Steps to Crack VLSI Interview"... Sounds Good :) But before I share with you these Steps, you should know how I have figured out these 5 Steps. I am in touch with several Industry experts (Technical and Non-Technical Managers), Recruiters (HR people), Universities, Colleges, Professors, Training and Placements Officers (TPO) and Last but not least "Students". Step 1: Evaluate Semiconductor Industry. When I say evaluate Industry, mean to consider several parameters, which can help you to understand: Are you on right path or not ? Parameter 1: Is this right Industry for you? First, you should know why you want to enter in this Industry. If it's because of following reasons then you are on the wrong path. Want "Huge Money in Short Time"
Are "Not passionate about Electronics"
Want to "Sit back and Relax in Long Run"
Want to "Start your Own business with Zero Investment"
Are "Not Interested In Coding and Automation"
Parameter 2: How Much you know about VLSI/Semiconductor Industry? This is something which is required big time whenever you do preparation for anything either it's any competitive exams or Interview or Semesters Exams. You can find a lot of material or instruments/tools which can help you to evaluate your preparation for the competitive exams. Similarly, Internal sessional exams helps you to evaluate for the Semester's exams. But we don't have any mechanism for Self evaluation for Interview or Written Test. Solutions or Answer of several Questions: Even if there are good number of questions available, what about their solutions or answers. Are these solutions as per Industry expectations? Check one of my book for VLSI Interview Questions: Static Timing Analysis. It's a Kindle edition. What if Interviewer asks something else? What if I am not able to perform well? How can I assure that I am ready for the Interview? These questions can be solved when you go through a system which can help you in Evaluation/Assessment. "No one can win all the time. But you have got to learn from all you do - Both Successes and Failures. Always do a Self assessment." Whole purpose of evaluation should be to categorise different topics in strong Vs weak basket. In the process of Self Evaluation - the most important thing is to know - where we stand right now. What are the weak and strong areas. If someone help us to find this part then we can easily fix rest of the things (More discussion on this in Step 4). When I interacted with students and I asked them about their study pattern, like how do you start preparing for VLSI Interview? Students shared that they start with the advance concepts and what do they do if they get stuck somewhere...the response was, we go back and clear (brush up) those concepts. But according to me, this approach is very complex and timing consuming. Check this picture. If you jump to the Level 4 directly, then there are equal chances to fall back or say it will take time to understand these concepts or may be you have to come back to level 3 to brush up linked concepts and then again you go back to level 4. Still if something is missing on fundamental side, there is equal possibility that you have to go back to level 2 and then level 4. This iteration can be "N" number of times. Basically you do not realize that there is big iteration or time spend in the whole process. Now, if someone tell you the study pattern with 100% success rate, then will it be good for you. Like during college – we have semester 1 and followed by semester 2 and so on. Every Semester has predefined syllabi by experts so that you learn fast and don’t loose interest. Similarly, while preparing for any competitive exam or preparing for an Interview – we should follow a Systematic approach as well, in terms of study pattern. Which topic to read first ? Which is the next topic in sequence ? What should be the Weightage of a certain topic and so on. This pattern is very simple and also proven by experts. Check below figure. There are Students who usually follow the simple and proven study pattern. But still they miss few things and get stuck at first level itself, unable to move forward. In this way, you will not spend your time on your strong area and day by day you will strengthen your weak areas only. When I say different topics, we need to understand that different topics have different weightage in the Interview process or say as per Industry requirements. 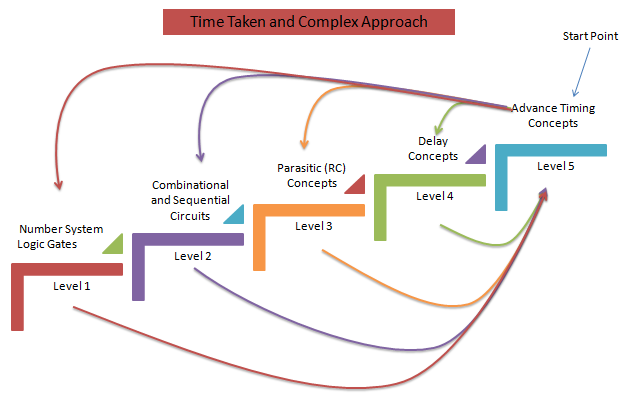 I mean to say that in Semiconductor Industry, if we give same amount of time to Number System and Sequential Circuits, it's not justified (even though there are equal concepts to study in both topics). We should also need to know what's required and how much it is required. And as per that only we should divide our time in brushing up different concepts. List of required Topics/ Concepts can be easily made using Google :) but weightage is not readily available to us from anywhere. When I am talking about the Profile building, most of the time students miss a lot of important things. Different Industries need a different type of Resume since they have different requirements. Now if you want to enter in a Semiconductor industry but in your profile you will mention Java, .Net and similar topics, it's not going to help you. It's very important to mention right set of skills in your profile. Apart from this, Semiconductor industry is very demanding and industry people are too busy. They don't want to spend lot of time with your profile to understand you (knowing that there are lot of other candidates with better written profile :) ). Your profile should be structured in such a way that information can be extracted very easily and as per other's requirement. There are 3 Major sub-steps of screening based on your profile itself. Screening by HR or Consultancy Firm: This one is highly focused on the keywords in your Profile. These keywords should be very well placed in such a way that it's automatically highlighted. Screening by Technical Manager or Leader: This screening is very fast if different sections are placed in a proper manner. There is no standard way for this but if you have divided your profile in sections properly, that reflects your presentation skill. For the Interview process or pattern, recommend you to refer Face to Face Interview Pattern. I am sure above mentioned 5 steps help everyone. In case of any query, feel free to drop me a mail or comment. Very nice article puneet !!! the details specified in article are very good sir. i am looking for a job as hardware design engineer. can you suggest what qualities a company looks for in a hardware design engineer candidate. Appreciated sir .... the way u are helping the students..
pre-employment testing companies who provide Employment screening services by conducting aptitude, personality and skills assessment test. Companies of all sizes use these assessment tests to hire the right people.